Clinitex standard dry patient wipes. Clinitex medium weight dry patient wipes 20 packets of 100 wipes. Clinitex large dry patient wipes 20 packets of 100. Clinitex dry patient wipes super size 18 packets of 100 wipes. Clinitex airlaid wash cloths 28 packets each contianing 50 wipes. Clinitex skin cleansing wipes 25cm x 30cm 8 packets of 100. Clinitex skin cleansing wipes 20 x 22cm, 12 tubs of 200 wipes. Clinitex skin cleansing wipes sized at 13 x 18cm per wipe, case contains 12 tubs of 100. Clinitex hard surface wipes in white, each wipe being 20 x 22cm and each case containing 12 tubs of 200. Clinitex surface safe sanitising in a tub of 500 each wipe being 23 x 20cm. Clinitex alcohol hand sanitising gel 6 x 500ml per case. Clinitex alcohol hand sanitising gel 80 x 50ml bottles. 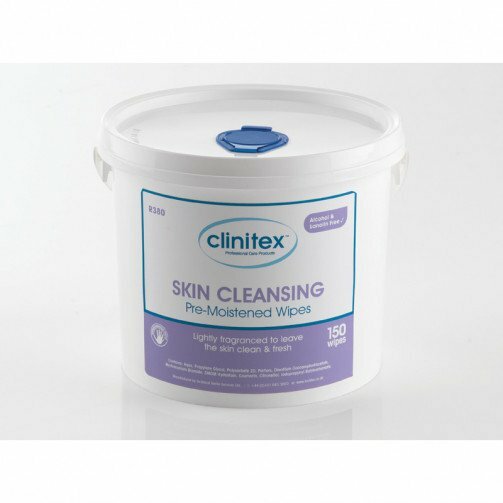 Clinitex skin cleansing wipes in buckets of 150 x 4, each wipes being 26cm x 30cm.Lightly fragranced to leave the skin clean and fresh.